Cayin SP-CD300 review | What Hi-Fi? Cayin Audio is owned and manufactured by Chinese company, Zhuhai Spark Electronic. And, if this CD player is anything to go by, it’s a name to be reckoned with. The CD300 has the feel of pricier offerings. There’s a choice of single-ended and balanced XLR analogue outputs along with coaxial and optical digital outs. In our system – Bryston BP26/4B SSST2 amplifier and ATC SCM 50 speakers – it sounds best through its balanced outputs, when its presentation gains precision and tautness. And tautness is something this player could do with. If you’re after a punchy, attacking sound that puts the emphasis on rhythmic drive, this isn’t the player for you. The Cayin is smooth and full-bodied, delivering dynamic changes with a rounded fluidity that’s easy to listen to and refined. Such an approach to music replay works well with gentler music such as Sufjan Stevens’ Illinois set, where the player’s natural warmth and harmonic richness helps to make the most of this lovely disc. The Cayin runs into trouble with more aggressive material, though. The likes of The Chemical Brothers’ Push the Button or Stravinsky’s The Rite of Spring reveal the presentation to be just a little too polite and easy-going to convince. It starts to sound a little confused when things get busy, too. If your musical tastes happen to coincide with the Cayin’s balance, you’re in for a treat. 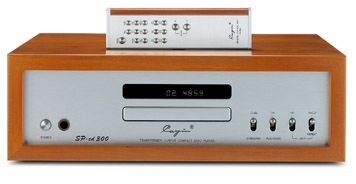 If not, and we count ourselves in this group, the likes of Roksan’s Caspian M2 CD player is a more compelling choice. Manufacturer Cayin Technology Co., Ltd.